The genasi are products of the union of elemental creatures, such as djinn or efreet, with mortals. While most are proud of their unique heritage and special abilities, they still dwell outside the mainstream of human society. A well-meaning half-elf wizard called Yrrick noticed this insurmountable barrier between genasi and the mortals dwelling around them. Having grown up of mixed heritage himself, Yrrick empathized with the genasi. Believing their position among mortals to be an untenable one, Yrrick set about creating a homeland for the genasi. In this effort, Yrrick was inspired by the elven Retreat to Evermeet. If the elves could escape to a homeland far removed from the world of orcs and humans, then so could the genasi, he reasoned. He envisioned a world where all four types of genasi -- air, earth, fire, and water -- could live together in peace, united by their common heritage and freed of the derisive or awestruck stares of the weaker mortals with whom they shared part of their lineage. Using powerful magic, Yrrick created a small demiplane and filled it with the four elements. He shaped sections of his new plane, which he named the Genasi Refuge, after each of the four Elemental Planes. He created a region of fiery mountains and lava flows for the fire genasi, and a vast ocean for the water genasi. He created a vast sky through which the air genasi might soar, and tall mountains of granite where the earth genasi might dwell. He shaped a fifth section of the plane in the image of Faerûn for those genasi who might yearn for their mortal homeland. Then, Yrrick created a pair of portals to link the genasi refuge with Faerûn. Satisfied with his work, Yrrick departed for Evermeet, confident that the genasi would forever benefit from his creation. Yrrick's work, however, is more of a testament to a single being's own drives and desires. In building the refuge, Yrrick was really attempting to build the kind of homeland he'd always wanted for himself: one where his mixed heritage would go completely unnoticed -- where he could feel as though he belonged. He failed to realize that most genasi are not troubled by their differences; most, in fact, feel superior to their less extraordinary human cousins. Yrrick had spent decades developing a sanctuary for the genasi that none of them wanted. The Genasi Refuge is now populated by a number of elemental, though none of these are genasi. There are several djinn, a few dao, and at least one efreet dwelling in the various regions of the demiplane. Parts of the demiplane are becoming a refuge of sorts, though not of the sort Yrrick intended: Criminals wanted on the Elemental Planes have discovered the refuge and have begun to use it as their hideout. 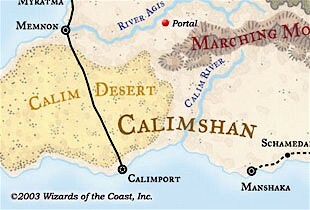 The portal created by Yrrick in Faerûn can be found near Calimshan, where air genasi are most common. It is keyed to allow only genasi to activate it, and it remains open for 1 round after activation. The portal in the refuge is in the central region, which Yrrick fashioned to look like a temperate part of Faerûn. A sign greets those emerging from the portal and informs them that they have entered the Genasi Refuge, where all genasi are welcome. A powerful djinn noble is hunting his mad half-brother, who is suspected of fleeing to the refuge. Ironically, this half-brother is a genasi -- perhaps the first and only genasi to willingly make the trek to the refuge. The PCs must apprehend or kill him. Alternatively, this half-brother is the leader of a resistance movement, attempting to overthrow the despotic rule of the djinn. The PCs uncover this and must decide whether they'll ally with the genasi against their former employer. A follower or scholar of Yrrick's work dispatches the PCs to look into the health and well-being of the genasi in the refuge. They find few genasi, of course, but they do find a host of hostile and angry elementals who resent the intrusion. The PCs discover an avenue from the Elemental Plane of Earth that leads into the mountainous region of the refuge. They may suspect that they are still on the Elemental Plane at first but soon realize that they are someplace else entirely.